Is it worth investing for power supply with low standby power? Come; go with me to explore the answer of this question. Nowadays power supply technology is advancing. There are so many features added that may or may not be useful for end users. It is important for the end users to define his requirements so that to get the right power supply with the right price. Is it practical to buy a high end power supply with several features on it but you do not use all these? It is a waste of money I can say. It is like buying a high end smart phone and your application is just call and text. Sometimes these added features are the selling point of a specific vendor over their competitors. There are cases also that with the added features, the price are increased. Meanwhile, below is the average cost of power supply per power rating. Let us cite an example that you decided to buy a 550 Watts power supply. You’re requirement for instance is to have the highest possible efficiency, so your option will be the platinum certified power supply. By the way, platinum, gold and bronze are certification from 80+ agency referring to power supply efficiency. Click HERE for more details on this. 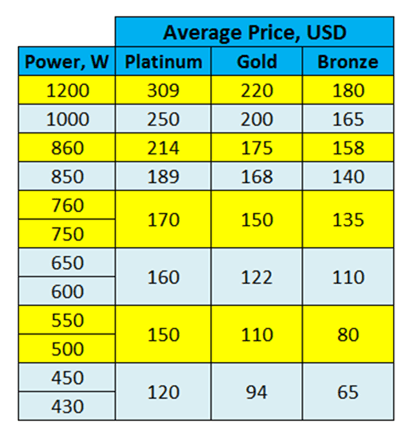 From the table above, the price of a 550 Watts platinum certified power supply is 150$US. The vendor or the distributor is offering you a variant of this power supply with a no load or standby load of 0.5 Watts only compared to the 3 Watts of the conventional one. The price offered to you is 20$US higher because you are only buying few pieces. Are you going to deal with the offered price and get the variant with a 0.5 Watts no load power? Let us analyze if you are really saving money. Based from the above calculation, the total 5-year saving in the energy cost is not justifying the purchase price differential. With this result, go for the conventional units with a 3 Watts standby power because in a 5-year period you are only wasting 40.5$US compared to the additional 100$US for the 0.5 Watts variant. You are only buying one or two units and there is a relevant price increase compared to the power supply with a higher no load or standby power. You can compute using above approach if you are indeed gaining for the entire power supply lifespan. You are purchasing larger volume wherein the vendor gives a huge discount on you. With this, the savings from energy bill for the entire power supply lifespan is surely higher than the price differential. Go for a power supply with the lowest standby or no load power but with the same cost with the others having higher no load or standby power. You are really saving money from it. If there is a price differential, try to do computation if indeed you are really gaining for the entire power supply lifespan. You can use above approach.